Joe Morrell and his daughters have made West Haven softball a family affair. Peter Hvizdak – New Haven Register. What better way to start the week than with a jam-packed edition of Linked Up? We can’t think of anything either, which is why we have this fresh edition with great stories from around Connecticut. Get fired up for a new week of high school athletics by checking out these stories. 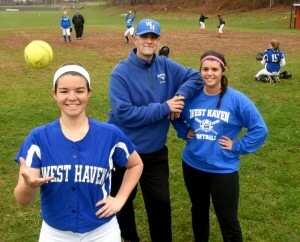 From GameTimeCT: The Morrell family has made West Haven softball a family affair. From WFSB.com: A look at Windsor Locks’ Khamri Thomas who concluded a stellar wrestling career this winter. From the Norwich Bulletin: Athletics Director Gary Mackowicki has enjoyed a long and successful career at NFA. From Theplayerstribune.com: Former major leaguer Curt Schilling offers strong advice to young people about avoiding smokeless tobacco. From the Connecticut Post: A pair of historically struggling softball teams are enjoying some early-season success. From the New London Day: Megan Brawner has made an interesting transition to help lead the Ledyard track & field team. From the Rochester Democrat & Chronicle: A common Linked Up topic, a story on how poor social media decisions can have big repercussions. From the Waterbury Republican American: The pitchers have been dominating early in softball. From the Danbury News Times: In the early season the Fairfield Prep baseball team has matched its hype. From JanGymBlog.com: A highly-successful coach offers seven tips on how to be a highly-successful sports parent. From the Norwalk Hour: An MVP for Wilton’s Erin Cunningham was buoyed by her teammates. From the Hartford Courant: A story on the fast start for the East Catholic baseball team is part of this notebook. From the Meriden Record Journal: Two girls lacrosse high school standouts have quickly adapted to the college game. From the Greenwich Time: A former Greenwich standout is following a long and winding road towards his professional baseball dreams. From the Middletown Press: Several honorees who made their bones in high school athletics were honored at the annual Gold Key ceremony. The Bristol Press: Three Southington wrestlers will be taking their talents to the college level. From SportzEdge.com: The Stonington High School Sports Hall of Fame class included a remarkable honoree. From Litchfieldcountysports.com: The Torrington track & field team was able to come home. From the New Britain Herald: The New Britain Hall of Fame class also featured some significant high school contributors. From the Stamford Advocate: Trinity Catholic hopes to reap the rewards of a new turf field.